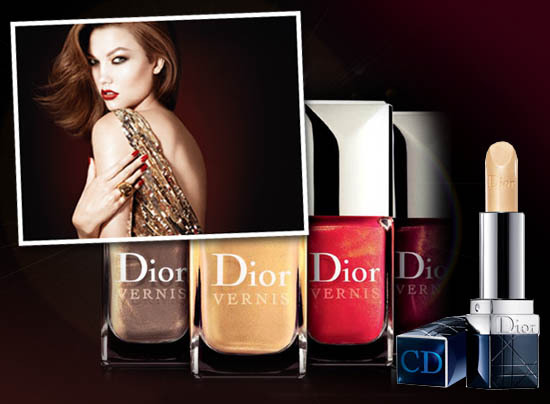 After the shadow-fest that was the Blue Tie collection, Dior's all about gold-shot matching lips and tips for Christmas. The Rouges Or collection will arrive on October 31st and is a neatly-edited offering of four nail shades and eight lipsticks. I've got two of each ahead of that, so lets have a look. 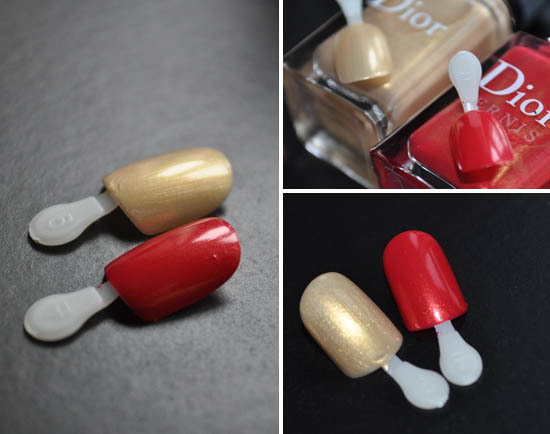 The four Dior Vernis Haute Coleur Extreme Wear Nail Lacquer shades, €22, are Apparat, Exquis, Or Divin (the gold), and Merveille (the brighter red). I'm not 100% what's what of the other pair. I've gotten Or Divin and Merveille to try and while I looked at these very dubiously (especially the gold, and nu-uh, I don't like it any better after swatching) because of all the shimmer shot through the mix, happily it doesn't translate hugely when they're on the nail, so I like 'em better now. Lets take a look at some of my real-girl shots. The press shot for the nails is pretty accurate - you know when there's a big (Photoshopped) disconnect between brand images and what you see in real life with your human eyes? It's not really an issue here. Sing hosannas. See - really super-duper shimmery. I am more of a fan of cremes, so didn't really love 'em at first sight - though clearly that bright lobster coral with gold is a beautiful-looking piece of beauty kit. Lets look at some swatches. On the left are Or Divin and Merveille swatched and snapped with no flash; bottom right with flash so you can really see the light hitting the gold shimmer that's such a part of this collection. Top right, the two swatches are placed on their respective bottles. Or Divin comes out pretty true to the phial shade but Merveille is a lot flatter - I like it better for that but you may be disappointed if you're hoping for snaky, streaky rivers of molten gold on your talons. OOhh, actually that sounds like it'd be rather nice, doesn't it? 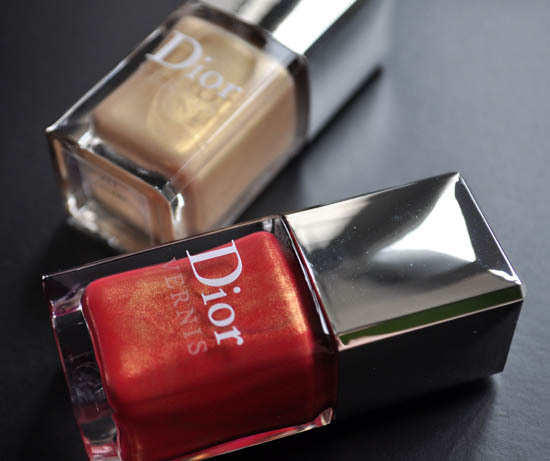 The other thing to say about Dior polishes is that, while even more expensive than Chanel, they are terrific. I love them - not sure why we don't give them more love but they always have great shades and finishes and oh la la, they have such an excellent brush. It's wide and fat and does a nail in a trice. Great stuff. Here's the press shot of four of the colours, which will come in Victorine, Fantasque, Versailles, Or Etoile (the gold), Cinderella, Constellation, Belle de Nuit and Nocturne. Each will be €30. There are seven reds, pinks and corals in the collection and one sheer, gold top coat which again, would not be my Cupan Tae O'Toole at all. Doubt Pat Ingoldbsy would be a fan either, if it came to it. Once more, I looked at the two samples I was sent dubiously. I don't like frost or shimmer in my lipsticks. I like 'em creme, please. These do have gold shot through them but it's not overpowering and it doesn't give you a bad dose of Mammy Mouth. It's probably at the very top of what I will tolerate shimmer-wise because these lipsticks do everything else well: coverage is excellent, flawless in one swipe, and comfortable with it. 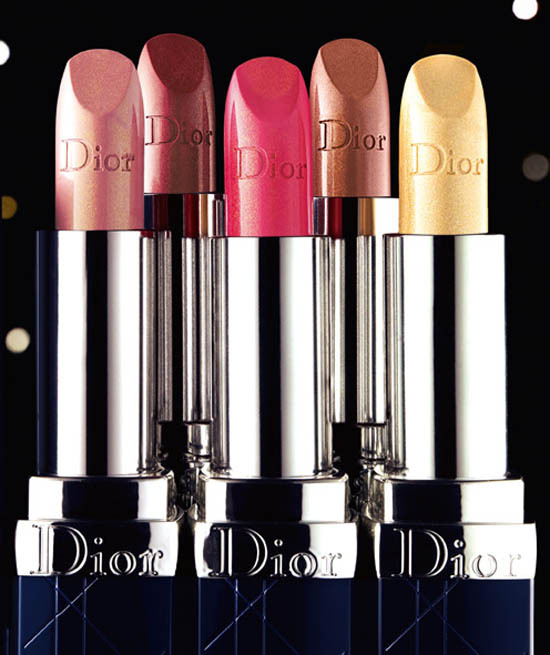 I do like Dior's lipsticks anyway, and love the scent of them - it's a really old fashioned powdery violet that's delish. 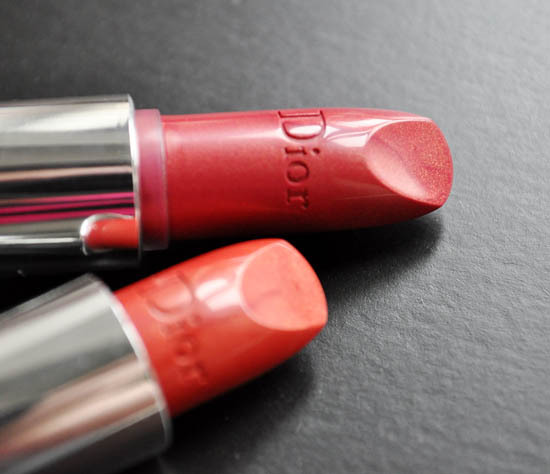 Now, there is a discernible shimmer off these when on the lips so beware matte fans, you probably won't like. 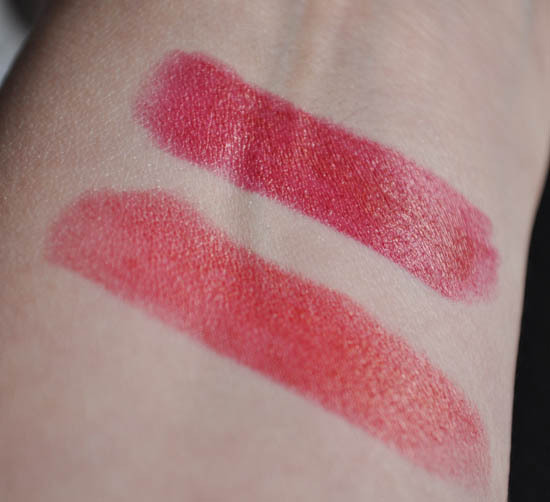 And again, Belle de Nuit is on the bottom with Nocturne swatched on top. 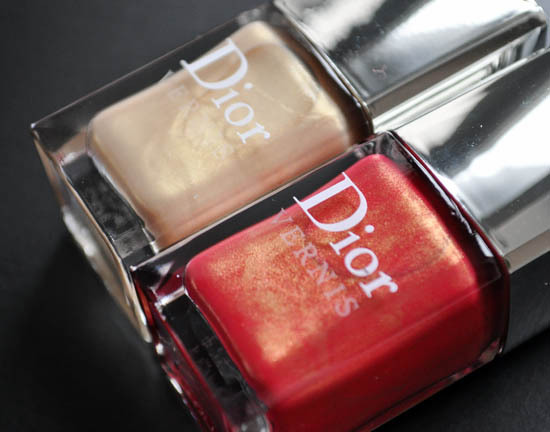 A close examination reveals the gold shimmer - you can see this on lips so make a note before you buy. It may not necessarily be on my wishlist for the ideal lipstick, but hey, it's perfectly seasonally appropriate! 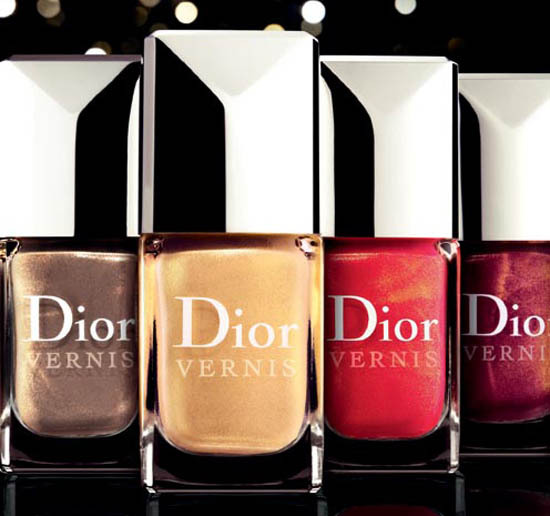 So - had you the cash to buy one nail shade and one lip, which pair would you pick?